Ostara is a wiccan holiday and one of their eight Sabbats. Ostara celebrates the spring equinox. The word Ostara comes from the Anglo-Saxon goddess name, Eostre. Eostre represented spring and new beginnings. The celebration of spring is present in many ancient customs, across all cultures, and it seems that Wicca has borrowed from many of them for Ostara. Like many other spring celebrations in other cultures, Ostara symbolizes fertility, rebirth, and renewal. This time of year marked the beginning of the agricultural cycle, and farmers would start planting seeds. 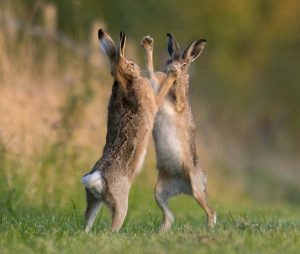 Photo of March Hares that are fighting. Photo Courtesy of Flickr user Nic Relton. Not for commercial use. Many of the symbols of Ostara have roots in other traditions, and the use of rabbits and hares is one such example. In medieval times in Europe, the March hare was seen as a fertility symbol, and a sign of spring. This species of rabbit is nocturnal most of the year, but in March, it is mating season for the animal. During mating season, March hares are seen all day long. Additionally, females of this species can get pregnant with a second litter while pregnant with their first litter. This explains why they were used as symbols for fertility. Modern day wiccans or pagans might go outside to meditate and perform a simple ritual to welcome the spring. Another common way to celebrate the coming spring is to plant seeds. Some families incorporate seasonal candy, such as peeps and chocolate rabbits, with their kids to help them get in the spirit of the event. Holi is a Hindu holiday that celebrates the arrival of spring, love, and fertility. It is also known as the festival of colors, as people gather powdered dye in many colors and throw it at one another. Holi celebrated in Spanish Fork, UT at the Sri Radha Krishna Temple in 2014. Photo courtesy of flickr user Steven Gerner; not for commercial use. How Holi came to be come from a legend that deals with the god Krishna, and his wife Radha. To understand this story, you need to know that Krishna had blue skin. As the legend goes, Krishna fell in love with Radha. However, he was worried the difference in their skin colors would be a problem. He told his mother about his concerns. She told him to go to Radha and ask her to paint his face any color she wanted. Doing this made Krishna less self-conscious of their skin color differences, and they fell in love. Some lovers continue this tradition by painting their faces the same color on Holi to celebrate their love. 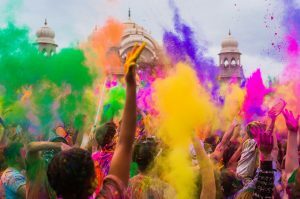 In the United States, to celebrate Holi, Hindus might go to their temple, or another large area and throw powdered dye at one another. It’s not uncommon to dress in white (but not nice clothes) for the occasion and go with friends and family and throw colorful powders at each other. Some organizations couple this event with a concert or other outdoor event of some type. Purim is a Jewish holiday and it is celebrated on the 14th day of the Jewish month of Adar. The religious months in Judaism are not based on the Gregorian calendar, so the dates of religious holidays vary from year to year. The story behind Purim takes place in the Persian empire, in the 4th century. During this time, the ruler of the empire was King Ahasuerus, and his wife was Queen Vashti. However, one day the queen disobeyed the king’s orders, so he decided to get a new wife. The king created a beauty pageant to find a new wife and queen. Esther, a Jewish girl, entered the contest, and the King chose her to be the new queen. During, and after the pageant, Esther never revealed her Jewish heritage. At the same time, a man named Haman was appointed prime minister. Haman was anti-Semitic, meaning that he was hostile or prejudiced against Jewish people. The leader of the Jews at the time was a man named Mordechai, and he was also Esther’s cousin. The king ordered everyone to bow to Haman, but Mordechai refused. Haman was upset at this, and convinced the king to issue an order to kill all of the Jews on the 13th day of the month Adar. This execution date was chosen by lottery. This is why this day is named Purim, as the word means “lots” in Hebrew. 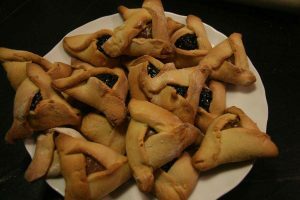 Photo of Hamantaschen, a traditional Purim food. Photo courtesy of flickr user Karen, some rights reserved. When Mordechai learns about this, he sends instructions to Esther through her servant. He asks her to beg the king for mercy on behalf of the Jewish people. This was not an easy ask, as it had been a month since the king summoned Esther. Appearing before the king without a summons was punishable by death. Esther decided to fast before taking action, and she asked that all Jews do the same. After fasting for three days, Esther put on her nicest clothes and went to see the king. She tells him that she would like to have a feast with the king and Haman. At the feast, the king asks Esther what she wants. She says that she wants him to spare her life, and the life of her people. The king, who is still unaware that she is Jewish, asks who would threaten his queen. Esther replies that Haman is to blame. The king then orders Haman’s death and makes Mordechai prime minister. He also gives Esther the power to overturn Haman’s orders. Esther then issued a decree giving all Jews in every city the right to assemble and protect themselves against anyone who may want to harm them. So, on the 13th day of Adar, the Jews defended themselves against their attackers, destroying them. The next day, the 14th day of Adar, they rested and celebrated their victory.